This article is about the philosopher. For the ski jumper, see Petr Chaadaev (ski jumper). 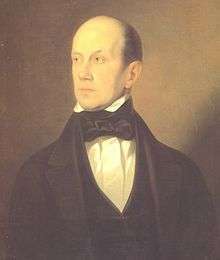 Pyotr or Petr Yakovlevich Chaadayev (Russian: Пётр Я́ковлевич Чаада́ев; June 7 [May 27, Old Style], 1794 – April 26 [April 14, O.S. ], 1856) was a Russian philosopher. Chaadayev wrote eight "Philosophical Letters" about Russia in French between 1826-1831, which circulated in Russia as manuscript for many years. The works could not be published in Russia because of its highly critical nature of Russia's significance in world history and politics. Chaadayev was born and died in Moscow. His surname is probably derived from the Turkic word Chaadai. After leaving Moscow University without completing his course in 1812, he entered the army and served in the Napoleonic Wars. Chaadaev's first hand observation of Tsar Alexander's reaction to a revolt in the Semenovsky regiment may have led to his resignation from service in 1820. From 1823 to 1826 he travelled in Europe, so that he was out of Russia during the Decembrist insurrection, though he was questioned on his return about his connections with many of the Decembrists. These connections may have contributed to his failure to find a position in the new government of Nicholas I. ↑ J. J. Saunders (2001). The History of the Mongol Conquests. University of Pennsylvania Press. p. 247. ISBN 978-0-8122-1766-7. (Russian) "Philosophical Letters", by P. Chaadayev. (French) "LETTRES PHILOSOPHIQUES ADRESSÉES À UNE DAME". P. Ja. Tchaadaev.